The Ibanez Mikro 3/4 scale electric guitar is perfect for last minute rehearsals, running scales while waiting for downloads, young rockers just joining the fray or anyone who just wants a smaller neck and body. 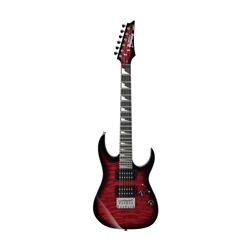 Not to be confused with other small guitars, the Ibanez Mikro is no toy. Mikro features the same construction, high quality and careful set-up of the Ibanez full size GRX and GRG models. Mikro's 22" inch scale length (standard guitars feature a neck scale from 24 3.4" to 25 1/2") makes it the right choice for beginner players or pros practicing on the tour bus.